The Calidore String Quartet are appearing at the BBC Proms this year, with their concert taking place on July 16 at 1pm (Click here to Listen Live on BBC Radio 3). We caught up with Jeremy Berry, Estelle Choi and Ryan Meehan who told us all about bringing their music to London and their upcoming album, released this November. Where are you from in the States? Jeremy Berry (JB): I was born in Bellingham, Washington and currently live in New York City. Estelle Choi (EC): I'm actually Canadian (Calgary, Alberta) but I live in New York City. How did you become part of the Calidore String Quartet? JB: We began as a quartet at the Colburn School in Los Angeles in 2010. At first we were playing just for fun (and class credit!) and things quickly took off from there. EC: After being in a quartet with Jeff Myers and two other players, Jeff and I decided to continue performing together. At this point the second violinist decided to devote more time to her solo work and the violist left for graduate school, so we were looking for two other people to join us. That's when violist Jeremy Berry joined us and then shortly afterwards Ryan Meehan on second violin completed the team. RM: I was asked to join a few months into the formation of the quartet as the second violinist. Can you tell us a little about your instrument in the Quartet, why you chose it and how you became interested in playing music? JB: I began playing the viola at age five. My older brother had began playing violin two years before and I went to all of his lessons from age three and got hooked on music. Soon after I began studying viola with the same teacher. EC: My cello is a French instrument made by Charles Jacquot in the 1860s. It is on loan to me by my former teacher, Ronald Leonard. I grew up in a musical household with three other siblings who played piano, clarinet, flute and cello so it was natural for me to pick up an instrument and begin playing. Being the youngest of four, I looked up to my brothers and sister and watched them excel at music. Having a cellist brother who was quickly outgrowing each new cello size he was given, I took on the most recently discarded instrument and made it my own. It wasn't always a straight road when it comes to deciding to pursue music as a career as I had a number of other interest (I loved my English literature and biology classes). However, at the encouragement of various teachers, I made the plunge after high school and haven't looked back since! RM: I play a violin made in Venice in 1894 by Eugenio Degani. I started violin at the age of 5 in my public elementary school music program. My name was selected through a lottery system to be part of this violin program. In July, you'll be in the UK as part of the BBC Proms season – how does it feel to be performing on a UK stage as part of the Proms? JB: We are thrilled to be a part of the BBC Proms series! We have known of the series and its amazing history for a long time and it feels a little unreal to be a part of it this summer! EC: The philosophy behind the BBC Proms of inclusiveness, exposure, and accessibility to all has always been an incredible model and example for all festivals around the world. It truly is an honor to be part of the history of the Proms and to share the stage with some of my closest friends is an added bonus. RM: It's surreal to be playing on such an illustrious series. The BBC has been so supportive of us over our past years as New Generation Artists, and we are looking forward to our reunion with so many of the engineers, producers and administrators who have become our friends over the years. Whilst you're over here, will you have much chance to sight see / travel? If you do have time, what would you like to see and do? JB: Sadly on this trip we will not have much time to sight see in London. We have been fortunate to spend quite a bit of time in London over the past few years though and I have particularly enjoyed the British Museum. EC: Our trip to London will be rather jam packed with rehearsals, recordings, and press meetings so we won't have much time to explore the city unfortunately. However, London is a city we love and frequent regularly so we've had the chance to get to know the area over time. I try to find a moment or two to wander the beautiful Hyde Park and I always check the Wigmore Hall schedule to see if I can catch a concert while I'm around. RM: As part of this tour we also visit Amsterdam, Munich and Cheltenham. Most days are full with travel and practice but I always find at least an hour to take a walk and do some sight seeing. Speaking of the BBC, whilst you've been a huge hit in the States, you're becoming well recognized in the UK and Europe too, including being part of the BBC New Generation Artists scheme – and the group were also recent winners of the Borletti - Buitoni Trust Fellowship – what does it mean for you to be receiving such acclaim in Europe too? JB: We were honored to receive the Borletti-Buitoni Trust Fellowship and join the BBC New Generation Artists scheme. It is a wonderful feeling to know that our art is reaching the UK and Europe and these awards have helped advance our career globally. The BBT has helped us out immensely with our quartet's projects and publicity. Being a part of the BBC scheme has given us amazing exposure to European audiences and has helped train us in the art of recording. EC: An important mission of our quartet is having an open perspective to music making and interpretation. Our influences come from around the world so we feel that it is important to share our music with as many diverse audiences as possible. Perhaps it is this approach to the string quartet repertoire that has appealed to listeners and we couldn't be happier that we have the opportunity to meet music lovers in so many different countries and cultures. RM: It has always been a dream of ours to play in the major halls and series of Europe. We have put a tremendous amount of effort in to making this possible but ultimately we would not have attained the presence we have in Europe if it were not for these wonderful organizations of people who have worked so passionately to promote us. As well as being part of the BBC Proms, you also have a new album out this October. Describing this new album, it's been said the group "wanted to find their own musical standpoint in the current environment of unrest and division". Can you tell us why you wanted to use music as a response to current world events? JB: It is more important than ever in times of political conflict and division to have art as a means of bringing us together. Our new album revolves around the conflict surrounding the lives of four composers and how they used their music as a reaction to the events in and surrounding their lives. EC: Personally, music has really become an extension of my own voice. Because the cello is so much a part of me, at times it can feel like the best vehicle to express my deepest concerns, hopes, and dreams. While so much is out of our control when it comes to world matters, as musicians we have the great privilege of using our artistic voice to process and cope with times of uncertainty and conflict. When we look back on the works of the greatest composers we can see how they were able to create masterpieces even when faced with incredible strife and difficulty. It is thus our duty as artists to honor their efforts and share their voices as a beacon of light when our surroundings can seem so dark. Which music did you choose for the new album to reflect on that sense of division within the world, and why did you choose those compositions? JB: Our new album includes quartets by Prokofiev, Janacek, Golijov, and Mendelssohn. Prokofiev wrote his second string quartet during the horrors of World War II. In spite of this, much of this work is filled with optimism and energy to lift the spirits of his people during such a dark time. In Janacek's "Kruetzer Sonata," we are given a passionate depiction of Tolstoy's novella involving the brutal murder of a woman trapped in a loveless marriage by her jealous husband. Janacek uses this piece as a vehicle to sympathize with the woman as the victim and make a statement for women's rights. Mendelssohn wrote his sixth and final quartet in the wake of his sisters death. This work blazes with hot fire as Mendelssohn casts aside his usual poise and elegance and replaces it with pure rage. Amidst all of this anger however is one of the most poignant and beautiful slow movements in the quartet repertoire. Osvaldo Golijov wrote his "Tenebrae" as a reaction to two separate events in his life. He juxtaposes taking his son to the New York City Planetarium and seeing the earth as a tiny blue speck in outer space with a visit he took to Israel amidst a new wave of violence. Though this special work has notes of violence in the middle section, it leaves the audience with a feeling of peace, hope, and tranquillity. EC: Each work of the album speaks to a time in the composers life where they were faced with hardship, whether an inner struggle or an outside conflict affecting them. Despite the time span that separates the repertoire, they are all important examples of artists who were able to take hardship and channel it through their writing to provide listeners with a means of understanding their situation and the world around them. The album takes us from Prokofiev in evacuation during the Nazi invasion of Moscow, to Janacek's struggles in a loveless marriage, to Osvaldo Golijov taking his son to a planetarium to wonder on the vast expanse of the universe amidst an outbreak of violence in the Middle East, and finally to the grief-stricken Mendelssohn, mourning the tragic loss of his sister. Each is a unique and fascinating look at resilience and its many forms. RM: In the the most difficult times of their lives, these composers turned to music to vent anger and fear but also tenderness, hope, and optimism. These works are imbued with such emotional potency that they are still revered decades and even centuries after their creation. We offer our performances of quartets by Mendelssohn, Prokofiev, Golijov and Janacek as a message of hope and resilience for our listeners because they demonstrate the human potential to create beauty even in the darkest of circumstances. What do you hope listeners will take away from hearing your new album? JB: We hope that our audience will see from this album that even in times of conflict, the beauty of great art still shines through. EC: We hope listeners will discover as we did that there are many ways to experience the changing course of events in the world. While it is natural to feel powerless amidst the chaos and uncertainty, everyone has a voice and can impact those around them by finding ways to express not only their vulnerabilities but also the hope and desire for better, brighter days. Conflict can bring tragedy, but our response to it can be one of great beauty. What's the best part of being a member of the Calidore String Quartet. JB: The best part of being in the Calidore String Quartet for me is being able to perform some of the greatest music ever written with such amazing friends and colleagues! EC: Having the opportunity to go out on stage day after day to create music with your closest friends is an incredible experience that remains new and refreshing despite the number of years that we've been together. As a musician, there are many elements to our profession that can leave you feeling very vulnerable when performing (the hours of practice trying to perfect the notes, fears of the audience reception, performance fright) but having a support system on stage with you that you trust entirely is a great gift that not all artists have. All the work we've done as a team in unifying our vision and interpretation of music new and old culminates under the spotlight and I am so grateful to share it with three lovely gentlemen! RM: The friendship, particularly the humor we share. Also the work ethic of my colleagues is very inspiring. Together we give each other strength and confidence to tackle difficult projects and tour schedules without any complaints or resistance. We share the same goals for our career. You can catch the Quartet's BBC Proms concert today (July 16) at 1pm at Cadogan Hall, and live on BBC Radio 3. The concert will be available to listen to as live on the BBC Radio 3 website via www.bbc.co.uk/programmes/b0b9yhtz. 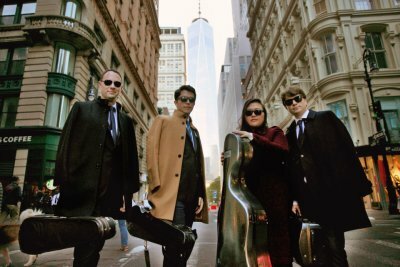 Also, go to the Calidore String Quartet website at www.calidorestringquartet.com/ to find out more about their new album, which is out on Signum Classics in October 2018.